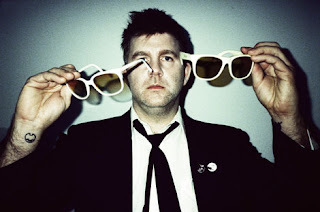 New Music Matters: New LCD Soundsystem Video for "Live Alone"
Franz Ferdinand released an EP Covers in honor of last spring's Record Store Day, inviting others to revisit songs from their 2009 release, Tonight. Both LCD Soundsystem and Blondie's Debbie Harry (together with FF's lead singer Alex Kapranos himself) took on the song, "Live Alone." Originally presented as a punchy dance tune, Harry gives it a traditional early rock girl group treatment but LCD Soundsystem takes the implied romance in the lyrics to a whole new level. James Murphy's crooning vocals brings out the yearning in every note. With this new video directed by Lustix, it also becomes another love letter to New York City with sweeping panoromic shots of skyline and dizzying night lights. In a futuristic twist, a robot is the protaganist of the story in a blur of heartache. Now that LCD Soundsytem is no longer, the longing for lost love is even more poignant as New York City moves on without a favorite local band.